A good character is the foundation of a good story. 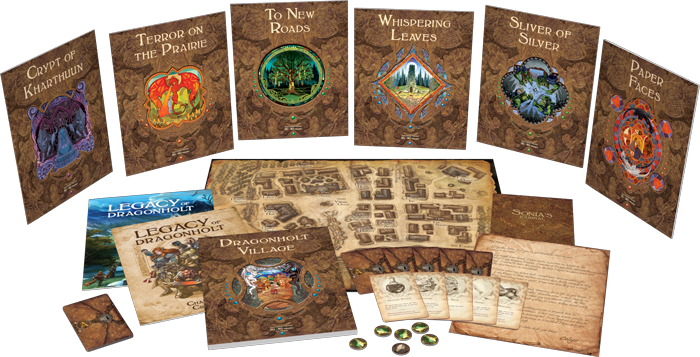 Legacy of Dragonholt, the new narrative adventure game for one to six players, transports players to a village in the realm of Terrinoth that they are free to explore however they choose as well as offering six unique quests to embark on. But before you take on your first quest, or even enter the village, Legacy of Dragonholt presents players with one of the most intriguing questions in gaming: who will you become? Before you jump into your first adventure, you will need to create the hero who will portray you throughout your adventures in the Runebound universe. Learn about the process and accompany us today as we create our own unique character who will explore Dragonholt in our stead! In Legacy of Dragonholt, you can embody one of six humanoid races that people the realm of Terrinoth. Humans and orcs are commonly found among the Free Cities, while dwarves keep their ancestral home in the Dunwarr mountains. The elves hail from the Aymhelin forest in the south, and gnomes and catfolk tribes are scattered throughout the realm. Your choice of race defines both your general appearance and the natural talents you have gained from the struggles that your people face. Each race has a particular set of skills associated with them that you are likely to possess, based on their environment and the culture surrounding them. The character that we create today will be exploring Dragonholt by themselves, so it may be prudent to have a physically strong character who could hold his or her own in a test of physical skill, but still be able to maneuver social interactions within the village. The rough mountain homes of the dwarves teach them athletics and endurance from a young age, and the dwarves value the legacy of their people, equipping them with history. This combination of athletics and history that the dwarves are known for could make a good fit. Also, the willpower that comes from their famous stubbornness could make for some interesting conversations. After you've chosen a race, your class broadly describes your training and talents, which will influence how you approach the obstacles that encounter during your quests. There are seven classes to choose from: apothecary, bard, brawler, knight, sage, thief, and wildlander. Like your race, your class description includes a number of skills that you are likely to possess. Knowing that we will have few or no other party members to call upon in times of strife, we decide to choose a class that emphasizes physical skills. This eliminates classes such as apothecary and bard that focus on mental and utility skills, but knight and brawler stand out as good options. 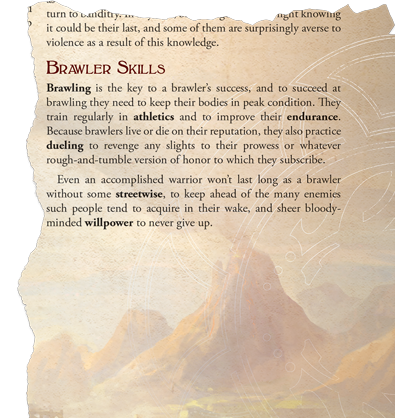 In the brawlers’ skills, we find a couple skills that are also attributed to dwarves, making this class feel like a natural fit, but there are a few additional skills that may also come in handy. For brawlers, the only school is the school of hard knocks. As such, many are forced into retirement from injury, but those who can make it earn a good living by fighting for spectacle or becoming bodyguards. This means that in addition to brawling and dueling skills, brawlers have the option to be streetwise. We can predict that this skill could greatly help with social interactions and gathering information from locals. Your character is defined by more than their race and class. You, like every individual, have your own story to tell. In step three, you describe your physical appearance, personality, and personal history, and choose your name. 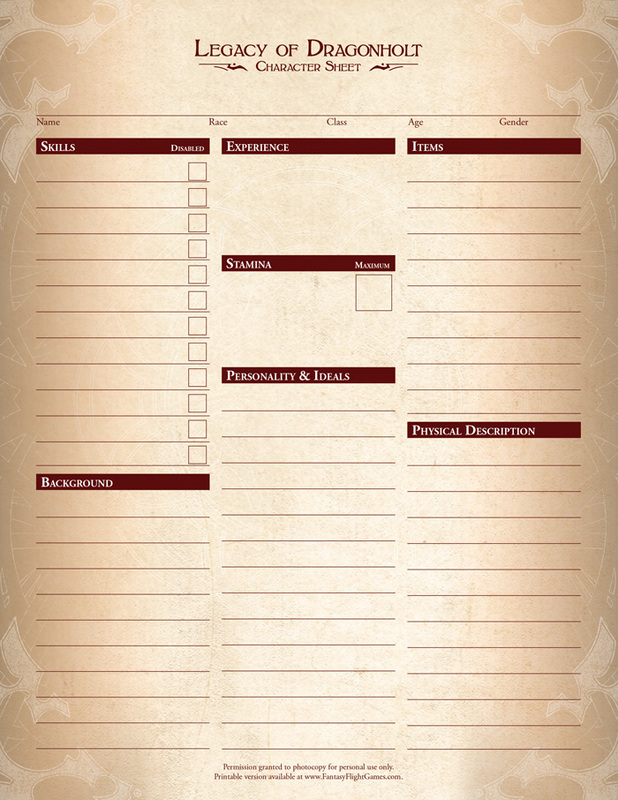 The comprehensive Character Creation book offers examples of physical descriptions, personalities, ideals, and backgrounds that you may use to guide your imagination. These examples also include skills, allowing you to see how you can bring the mechanical side of your character into play with your character's description. While these choices may seem cosmetic, they shape the story by influencing how you will react to the types of people you encounter and how you approach the many decisions you will face throughout your quests. Your hero’s story is what sets them apart and makes the stories you weave in Legacy of Dragonholt truly your own. For our hero, let’s make her an experienced brawler who spent her life fighting for glory and profit, until she eventually earned enough to open her own establishment. Now, she hosts grand spectacles of her own and trains new fighters in the trade. 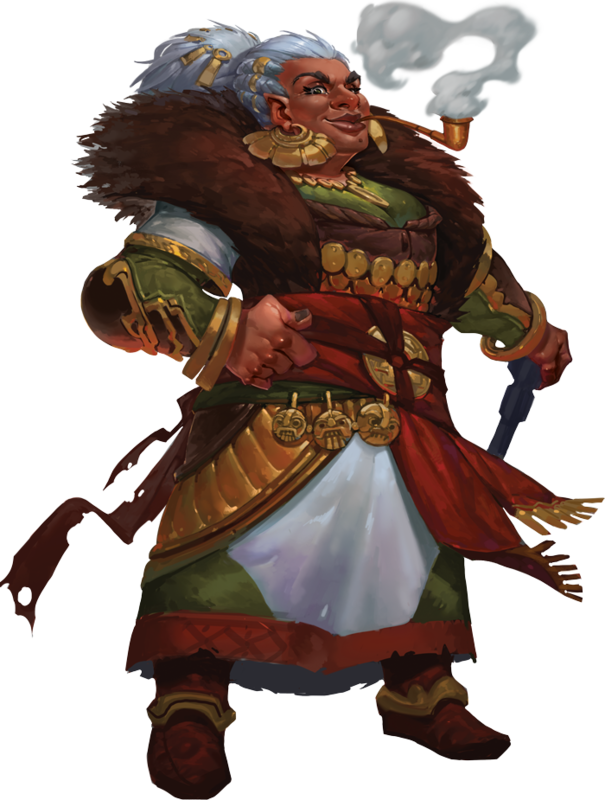 She has a strong, stocky build typical of dwarves, and her once-dark hair has turned silver with age. She dresses well, in a style that reflects the wealth she has earned over the course of her career—but with aspects that evoke the armor she's spent her life wearing. While she is mostly retired herself, she is far from feeble. She remembers every brawl she ever fought, believing that we are nothing but a collection of our past experiences. Looking to the future without regard for the past can lead only to disaster. Finally, we need a name that feels right for reflecting her strength and virtue—Brigid. Skills represent both your inherent talents and the training you have received. There are five types of skills: combat, physical, mental, social, and utility. You may require skills in any combination of these types depending on the challenges you encounter over the course of your adventure. You may select a total of five to eight skills, at least two of which must appear on your race list and two of which must appear on your class list. Subsequently, you may choose any additional skills freely based on your personality and the ideals you've decided on for your character. In addition to skills, you have a maximum stamina that represents how far you can push yourself before you collapse from exhaustion. If you possess only five skills in a party of three or more, you will have the maximum stamina of fourteen. For each skill you add beyond this, your stamina decreases by two. Maintaining a greater number of skills ultimately requires more work, leaving less energy for your stamina. But if you are a misanthropic adventurer traveling in a party or one or two, your maximum stamina is increased to keep you protected on your dangerous quests. To choose Brigid’s skills, we begin by looking back at her race and class. It seems natural that she would have willpower and history, then brawling and endurance to aid her in her career. She can add another skill without losing any stamina, and streetwise would fit well with her background as both a fighter and an entrepreneur. However, at this point Brigid does not possess any utility skills. Brigid is an entertainer and with a lifetime of experience, she has more than a few stories to tell. Therefore, performance suits her well. Apart from her ability to spin a tale, this skill will also enable her to lend courage and hope to any allies as they embark on their quests. With this final addition, Brigid is complete and ready to begin the trek to Dragonholt. Once you have created your own multifaceted character, you are ready for adventure. Whether you set out alone or with a troupe of heroes is entirely up to you. Either way, one thing is certain; if you choose to journey to Dragonholt, you will not be the same when you return. Discover who you are. 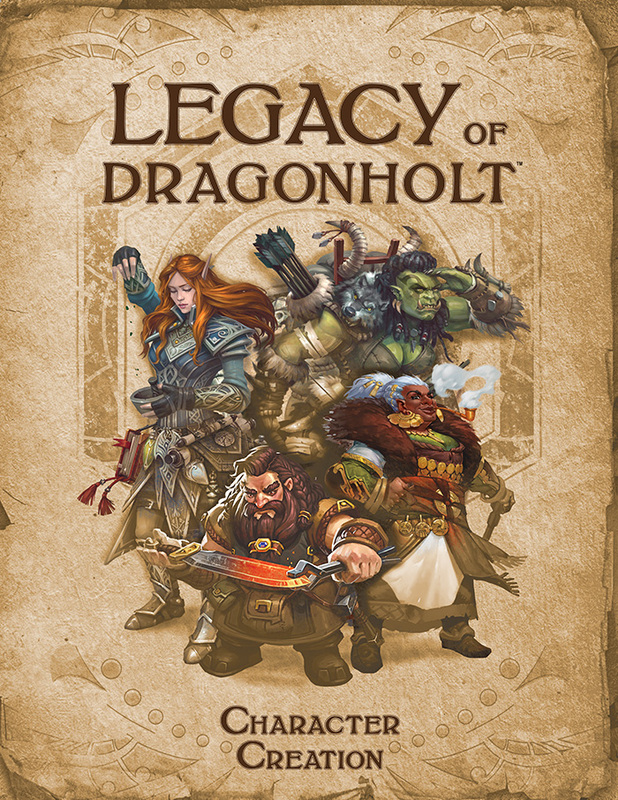 Forge a new identity in Legacy of Dragonholt and become the hero of your tale! 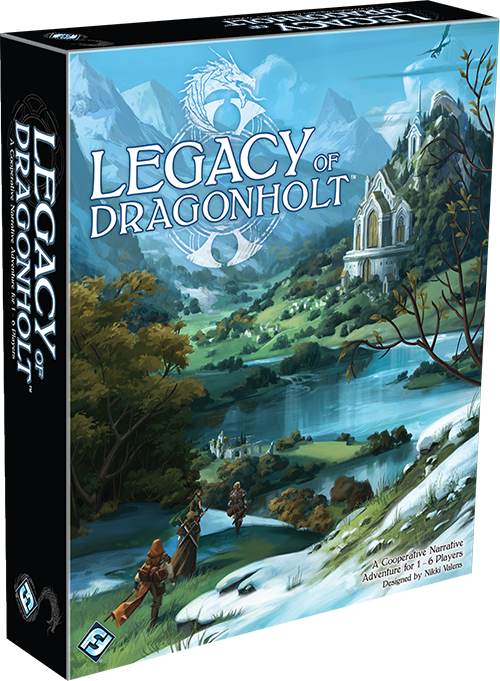 Pre-order Legacy of Dragonholt (ORA01) from your local retailer today or on the Fantasy Flight Games website here!